Today, there is only one Microsoft partner with a broad Lync qualified portfolio and Skype for Business voice and video expertise—Polycom. Polycom has 40+ solutions for Microsoft. 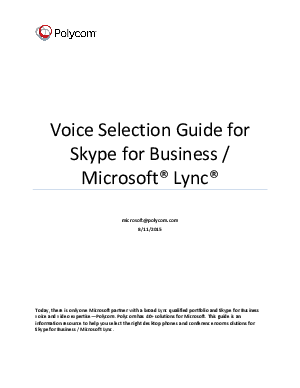 Download the Voice Selection Guide for Skype for Business as an information resource to help you select the right desktop phones and conference room solutions for Skype for Business / Microsoft Lync. Polycom has several one-of-a-kind solutions for Microsoft including: USB-only plug-and-play options for use with the Skype for Business softphone, IP conference phones with multi-directional microphones, 360-degree cameras with active speaker tracking that provide voice calling and Installed audio solutions supporting ceiling microphones and multiple speakers.